Electrical and Mechanical Engineer, graduated in 1953 from the Polytechnic School of USP. Teaching Assistant and Assistant Professor at the Technological Institute of Aeronautics (1954-1956). 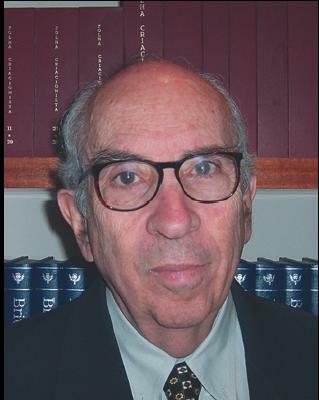 Emeritus Professor of the School of Engineering of São Carlos, University of São Paulo. Founding Member of the Academy of Sciences of the State of São Paulo. Founder and President of the Brazilian Creationist Society since 1972. Member of the Federal Council of Education, 1974-1980. Scientific Director of the Foundation for Research Support of the State of São Paulo for two terms, from 1979 to 1985. President of the Association of Engineering Education for three terms. Member of the National Academy of Engineering since 1994. Minister of Education and Culture (MEC) representative on the Board of the Brazilian Space Agency, between 1997-2003. Member of the Pan American Academy of Engineering since 2006. A model (a theory, or deductions taken from the model or theory) must be subjected to prove for your co-validation. A long time may elapse between the formulation of a model or theory and its rejection for not being able to explain new facts discovered, or for having made predictions that have not been proven. Thus, theories that are now accepted as "scientific", tomorrow these may be discarded by the scientific community itself, for not withstanding the test of their hypotheses. This is indeed the mechanism of "evolution" of science itself, as some philosophers of science have highlighted in their works. Incidentally, we could mention Thomas Kuhn who, in his book "The Structure of Scientific Revolutions", highlights the changing history of the scientific "paradigms", such as, for example, the Theories of Phlogiston, the Caloric, the Ether, and others in the field of physics and chemistry. Considering the various fields of human knowledge, and trying to define them, you can see that initially there is a "Field of Models, Theories and Deductions", which includes the observation of the object under study, either directly or indirectly through instrumentation, and which can be extrapolated beyond its limits. Within their own limits models, theories and deductions will evidently have a greater chance of success to describe reality as they will be based on tangible evidence. Off the limits, however, the chance of success ends up being small, because one ends up being dependent on reasoning techniques that will replace the nonexistent evidence. The simple replacing of observation by reasoning can cause considerable distancing from reality! Given these observations, one can move on to the consideration of Evolutionism and Creationism under the Scientific Method. It is clear, then, that creationism is not, nor claims to be based on the Scientific Method, as it cannot be subjected to the proof of the hypothesis required by the Method. Creationism is in fact based on basic concepts that are accepted as true by faith in a revelation. In the case of Biblical Creationism, we accept the revelation given through the reports of various kinds, which are directly or indirectly expressed in the Bible. On the other hand, although Evolutionism claims to have scientific basis, it cannot be subjected to the proof of hypothesis, since it is based on concepts that are accepted as true solely by an act of faith and who can not be demonstrated, as they constitute a theoretical model that makes assumptions impossible to be proven. As an example of unverified hypotheses, both in the Evolutionism as well as in the Creationism, one can mention those related to the origin of life, or the transformation of the species from the level of Order to the level of Family in Biological Taxonomy modernly accepted. Thus, doctrines such as Evolutionism, as it is shown in the most cases, also Creationism, can not be called "scientific," as they are located in the "Field of conjectures", exceeding by far the "Field of Models, Theories and Deductions", for the absolute absence of tangible evidence that can be subjected to the scrutiny of the Scientific Method. In fact, the events to which both doctrines refer are set in a time range inaccessible to any experimental observation technique, or rational procedure, within the requirements of the Scientific Method. Both "doctrines" are actually "conceptual structures", as in the meaning introduced by the philosopher of science Karl Popper, or philosophical positions assumed a priori, for the application of the Scientific Method with a view to understanding the objects that surround us. From the foregoing considerations, it is concluded that, in reality, Evolutionism and Creationism are not "Science", but effectively two extreme and different ways ("Worldviews" or "conceptual structures") to accept an explanation for the origin of life, for the biological categories, for our very existence as rational beings, for the existence of our planet and our solar system, galaxies and for the very existence of the universe and a Creator. The proposed explanation transcends the potentialities of Science and the Scientific Method, and it may be accepted by just an act of faith – be it creationist faith, or be it evolutionist faith! Contrary to the established belief accepted by the (silent?) majority of those who develop scientific activities, Evolutionism definitely does not meet the requirements to be considered as a Science. It is, philosophically, only a conceptual framework!